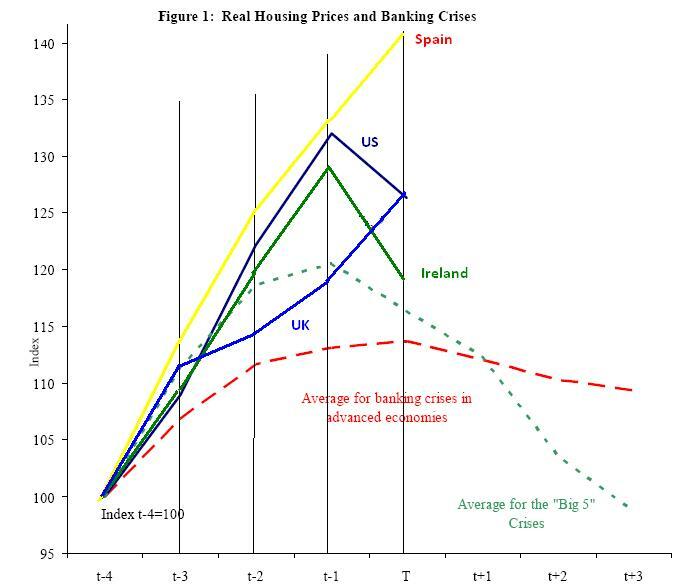 Housing Prices and Banking Crisis in the US – and Europe? Carmen Reinhart and Kenneth Rogoff have prepared a paper titled “Is the 2007 U.S. Sub-Prime Financial Crisis So Different? An International Historical Comparison” (download here). They present a graph showing the developments of real housing prices before a financial crisis. The graph shows the US in comparison with some crisis scenarios. What are the implications for the euro area? Well, Ireland and Spain have had economic miracles with extraordinary growth rates that I think have been caused by access to the European Union. So if they will have economic difficulties, they can hardly complain if the ECB does not deal with their problems. The rest of the EU seems to be in good shape (no housing bubbles), except for the UK, of course, which is not part of the euro area. Barry Eichengreen recently found it very unlikely for the euro area to break up, mostly for technical reasons of reintroducing the national curreny.